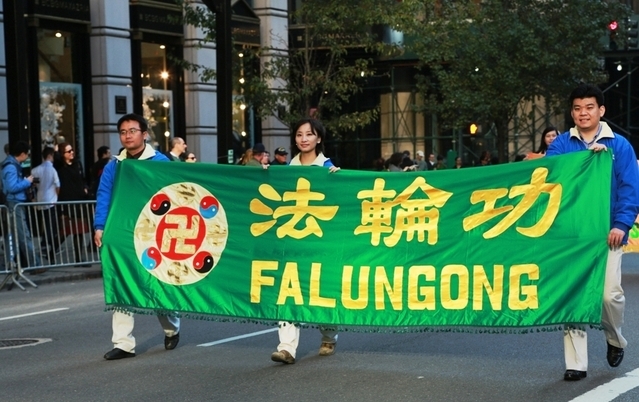 On November 11th, Falun Gong practitioners from New York participated in the annual Veterans Day parade on Fifth Avenue, from 29th Street to 52th Street. About 200 groups performed in this year's Veterans Days parade. The Falun Gong contingent was the last one in the parade. It consisted of the Divine Land Marching Band, a celestial maiden dance team, an exercise demonstration group and a waist drum team. The practitioners' performances were warmly welcomed by the spectators along the length of the parade route. Jazzy from Manhattan liked the colourful costumes of the practitioners dressed a celestial maidens. “I want to join them,” she laughed. 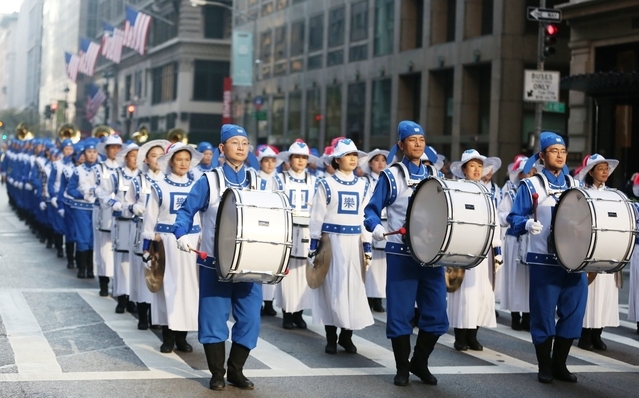 Yi Rong, the contact person for the Falun Gong contingent, said that through the parade, practitioners try to bring people the beauty of Falun Gong. MY9 TV station broadcast the parade live from 12:00 pm to 3:00 pm. Viewers in Baltimore, Washington D.C., Orlando, St. Paul, Minneapolis, Chicago, Houston, Dallas, Phoenix, and Los Angeles can watch it on MyNetwork TV station or on the website www.vetsday.org.